John Cale took part in an infamous 18-hour performance of Erik Satie's "Vexations". While there is no recording of that performance (think of all that tape! ), a video has emerged that's quite fascinating. Others have called it "astonishing", "jaw-dropping", "priceless." And I can't disagree - try to think of a network or channel that would play this today. I've mentioned it before, and still don't really know what I think about the thing. It's certainly hypnotic, and enjoyable enough - it has that great late 19th-century crepuscular French mystic mood going, and that's worth something. 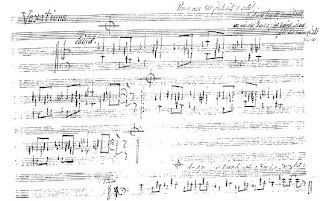 You can read fascinating notes on the piece by a pianist who performed it in totum with only one partner, or the opaque Wikipedia entry on the piece, too, if you want a variety of nearly baseless speculation. Try putting it on repeat, and see what you think after 840 playthroughs (to be honest, I'm not sure whether he plays one cycle or three). Volunteer for this experiment by downloading it here. The audience's titters may be distracting at first, but I find that they ultimately blend in well with the music, giving it some texture. God I'm being pretentious. Let me know how you make out, OK? At first, it sounds like a weird distortion of "Adeste Fideles," though after a couple of listens it sounds even older, like the skeleton of a baroque fugue with all the interesting counterpoint stripped away. A few repetitions after that it is simply annoying, and the looped burst of laughter from the audience becomes a nails-on-chalkboard stimulus, like the gunshots some joker DJ overdubbed onto "Come As You Are" after Cobain's suicide. After more repetitions than I could count, I believe I referred to this as "demon music"- vexations, indeed. I like how smoothly it loops - until the laughter came around again, I wasn't sure if it had started over or what. Not sure if I like it or not - playing it on repeat kind of reminded me of the Buddhamachine. "Thank you, Mr Cale. You have a will of iron." That's a tombstone quote, right there—perhaps the best possible summation of the man's maddening pursuit of his own path; certainly the most succinct. A-heh-heh-heh, it sounded like "whim of iron" to me. There's quite a bit of truth in both, though. The point of the thing may have been to ridicule progressive artistes, but at least Erik Satie got played on network television, and that's a victory for something.